EDINBURGH’S controversial trams project has been targeted by a new protest craze from north America. 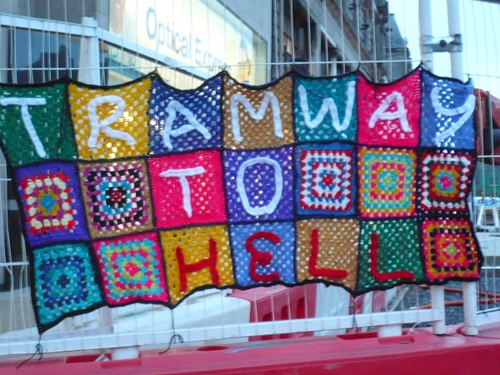 A colourful, crocheted banner which read “Tramway to Hell,” was draped on fencing next to tramworks by a militant knitter on Tuesday evening. The protest is an example of “yarn-bombing” in which crocheted protest messages are used to get across messages. Mary Gordon, who took a picture of the message, said: “I was making my way home when it caught my eye. 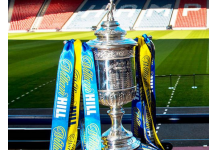 It was on tram barriers close to Waverley Station. “Quite a few people were gathered in front of it, having a look and taking pictures. Tram workers claimed the creative protest was removed and being kept in one of their cabins on York Place. The Council confirm that the banner is in their possession and that the owner can claim it back at any time, no questions asked. Grant McKeenan, who started his own anti-tram post campaign thought the idea was great. Lesley Hinds, Edinburgh’s city transport leader, said: “When unofficial banners are put up it’s normally the process that they are removed, in care they come loose and flap into the face of a pedestrian or into the path of a cyclist. Yarn-bombers participated in this year’s Fringe Festival by decorating benches in Princes Street Gardens with their artwork and knitted pom-pom bunting. In August, knitted “jumpers” were spotted on lampposts on Elm Row. Yarn-bombers in the Yukon, Canada, recently covered an entire vintage aeroplane in a knitted “jumper.”. Other adventurous “bombers” in the US have covered yellow schools buses, cars and 30 feet trees and all its branches. In June 2011, two German students in Dusseldorf knitted anti-nuclear signs and yarn-bombed a tank in protest against the war in Iraq. They covered the tank in its own pink wooly “jumper”.